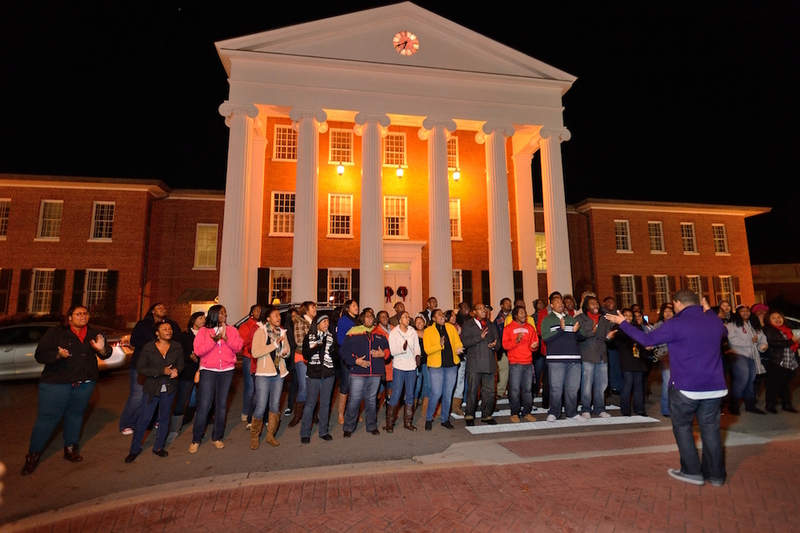 The University of Mississippi Gospel Choir (UMGC) is an African American student-run singing group. Founded in 1974 as the Black Student Union Choir, the choir was one of the first African American student organizations on the historically white campus. In 2001 the choir received a Grammy nomination for its debut album, Send Up the Praise. The choir’s history and success are a source of pride and encouragement for African American students and alumni. The choir is also a significant symbol of the changes at the university since the violent 1962 riots over desegregation. In 1974 Otis Sanford, president of the Black Student Union, and his roommate, Jerry Christian, recruited Linda Redmond, a freshman musician, to help start the Black Student Union Choir. Twelve years after the university’s integration, only about three hundred African American undergraduates were enrolled. In this culturally alien and at times hostile environment, the choir provided spiritual and social support for its African American members. The founding of a gospel choir represented a significant moment in the process of integration. By the early 1970s African Americans had started to make their mark on the university’s student politics and athletics, but the Black Student Union Choir brought a uniquely African American religious artistic expression to the campus. Rooted in the welcoming tradition of the black church, the choir did not require participants to audition, a practice it continues to this day, and it at times has had more than one hundred members. Performing a selection of contemporary gospel songs, anthems, and spirituals, the students sang at campus concerts as well as at members’ home congregations. In 1991 the choir changed its name to the University of Mississippi Gospel Choir and sought funding as a student organization independent of the Black Student Union. The new name indicated African American students’ growing confidence at the university and their continuing desire for integration: the choir wanted not just to be granted a place but to be recognized as a part of the university. In April 1998, accompanied by gospel musicians recruited from Memphis and assisted by Jackson-based Malaco Records, the choir recorded a live concert in the university’s Education Auditorium. In 1999 Malaco released the concert on a CD, Send Up the Praise, that brought attention from both the gospel world and national media. In 2000 the choir appeared on Black Entertainment Television’s Gospel Explosion, and in 2001 the CD received a Grammy nomination for Best Gospel Choir or Chorus Album. The morning of the awards ceremony, NBC’s Today Show ran a piece on the choir, placing the students’ achievement against the backdrop of the University of Mississippi’s troubled racial history. The choir’s success has raised its profile. In October 2006, forty-four years after James Meredith became the first African American to attend class at the University of Mississippi, UMGC sang at the dedication of the civil rights monument at the heart of the campus. In 2014 the choir celebrated its fortieth anniversary with a concert at the Gertrude C. Ford Center for the Performing Arts on the university campus.